My gf had severe eczema on her hands, arms, shoulders, eyelids and mouth. After reading Mr.Heisenbug’s post about how he managed to cure himself of eczema I had her follow his strategy. It appears the bacteria L.Plantarum has the ability to cure eczema. L.Plantarum is found abundantly in many fermented foods and sometimes yogurt and kefir. 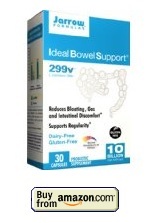 It has considerable immune modulating abilities and helps tighten up the junctures in the intestinal lining preventing leaky gut. After two weeks with of supplementing with 2 capsules a day of Jarrow’s L.Plantarum formula her eczema symptoms abated considerably. She is now very nearly cured. It also seems that using supplemental Resistant Starch have a synergistic effect assisting the L.Plantarum in doing it’s healing work. There is also one supporting study that came to the conclusion L.Plantarum helps cure atopic dermatitis. A randomized trial of Lactobacillus plantarum CJLP133 for the treatment of atopic dermatitis. Effect of Lactobacillus sakei supplementation in children with atopic eczema-dermatitis syndrome. The following is some of my theorizing that led me to this cure. “Signals from the autonomic centers travel out of the brain to reach every tissue and organ in the body, from tiny muscles of the hair follicles of our scalp, to the sweat glands of the feet, and just about everywhere else in between. Scientists divide the ANS into two distinct branches, the sympathetic nervous system (SNS) and the parasympathetic nervous system (PNS), each consisting of its own very unique set of nerves designed to carry out a particular set of instructions. The SNS and PNS tend to work in contrary ways, in opposition to each other, not to struggle and fight, but instead to allow very precise management of our every metabolic activity from second to second. When the SNS fires, for example, heart rate increases, as does the strength of each cardiac contraction: the small arterioles of the skin and those along the entire digestive tract constrict, while the vessels that feed into the muscles and into the brain dilate, to allow easier and stronger blood flow. As a result, blood pressure rises and blood itself gets preferentially shunted from the gut and skin to the muscles and brain. Furthermore, the sympathetic nerves inhibit virtually all digestive processes and processing, including the secretion of all the various digestive juices as well as peristalsis, the series of muscular contractions that propel food along the intestinal tract. At the same time, the SNS signals most endocrine organs, including the thyroid, the adrenals, and the gonads, to release their respective hormones. The point is that those who are PNS dominant have increased blood flow to the skin. The good part of this is when the PNS system is in balance the skin is supplied with all the necessary nutrients leading to beautiful looking and feeling skin. However if there are other underlying problems, increased blood flow can also cause inflammation, one of the key characteristics in eczema. The skin as a firs line of defense to the outside world is also the site of mucous membranes and histamine activation thus often leading to allergy like symptoms in PNS dominance. The skin is also one of the body’s ways of detoxification, so underlying toxic issues can also manifest themselves through the skin, especially so because of the increased blood flow. Dr.Kelly the man who created the metabolic type diet, even formulated a test based on skin response to a supplement in order to determine PNS dominance. Hormones get transported through the blood and deficiencies, or overabundance may cause issues in the skin. This ties in with your liver and body’s ability to metabolize and detoxify certain compounds. Due to genetic factors controlling various methylation and detoxification pathways for estrogen, production of quinones can become enhanced. These can cause oxidative stress to the skin tissue due to increased blood flow to the skin area. In fact it is likely that any thing that cause oxidative stress especially connected with the blood, will manifest in tissue damage, inflamation, and immune reaction at the skin level. I believe this to be the underlying problem in most skin issues such as psoriasis. Now for women this can be particularly concerning in that in the breast area since there are a lot of estrogen receptors and estrogen production going on. 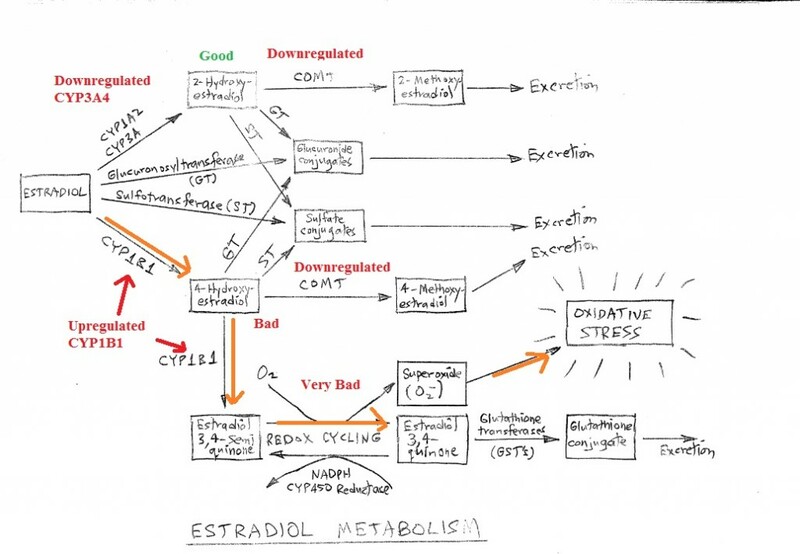 The production of estrogen metabolite quinones, can begin a cycling process releasing massive amounts of oxygen free radicals. These strike the surrounding breast, and skin tissue causing serious damage. If DNA and various protein molecules become damaged the body tags it as foreign and mounts an autoimmune system response. This is what appears to occur in psoriasis. The skin is also partially destroyed causing it to try and rebuild itself, with concurrent destruction. This can cause layering effects of healthy and damaged skin due to the ongoing process, causing raised lesions. In the case of breast cancer oxidative damage to surround DNA can cause mutations which then go on to cause the cancer. For psoriasis and breast cancer one can supplement with DIM to help the production of good estrogens there by preventing the production of quinones and oxidative stress. This seems to suggest then that up-regulated CYP1B1 oxidative damage would occur in those organs and places where it is expressed most. Of interest here is the ovaries, breast and adrenal glands. The oxidative damage potential in the adrenal glands probably has an effect on the production of corticosterone impairing it’s production thus leading to eczema. 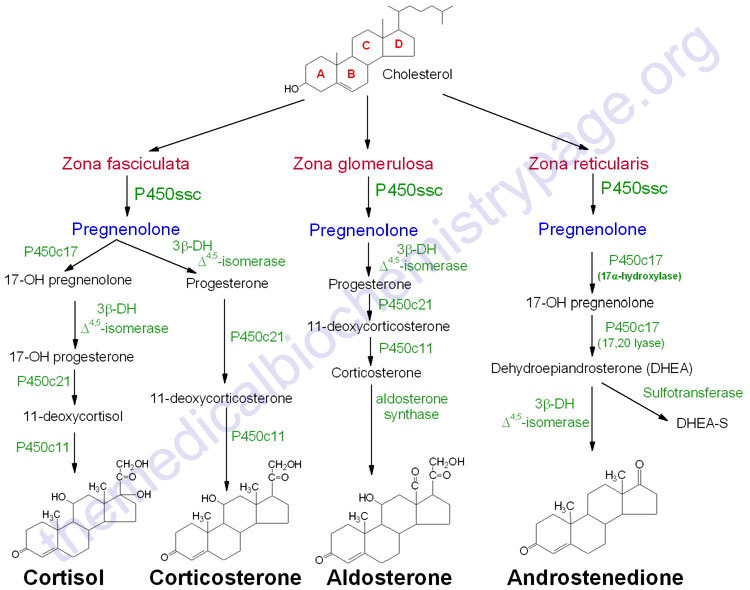 Corticosteroids/corticosterone a subset of Glucorticoids (glucose + cortex + steroid) are naturally produced in the adrenal cortex of the body and help regulate inflammation by constricting blood flow. They are produced alongside cortisol in times of stress in the fight-or-flight response which is the hallmark of the SNS response. Among PNS dominance cortisol production is subdued compared to SNS dominance explaining the link here. Topical steroids are classified based on their vascoconstriction abilities. This is why corticosteroid creams work at helping control eczema and inflammation. It would stand to reason that people with PNS dominance might need more corticosteroid production in order to help regulate the blood flow to the skin. Now what genetic and nutritional factors play a role in the production of corticosteroids? Isopimpinellin – A compound from the Carrot or Parsely family. Caffeine – this increases cortisol production, increases heart rate and constricts blood vessels.